2007 Officers: President - Jim Lobdell; Vice President - Gerald Williams; Treasurer - Al Rowe; and Secretary - Pat Williams. Board Members are: Allen Youngs -1yr; Ernie William - 1yr; Warren Smith - 2 yrs; Jim Vanqieson - 2yrs; George Ballard - 3yrs; and Allen Bush - 3yrs. Contact Jim Lobdell, OGC president at (607) 843-2701 or email: JBL4949@frontiernet.net re: membership; facility rentals; Clambake, Trap Shoots, or Slug Shoots. Club History: The Oxford Rod and Gun Club was incorporated on November 26th, 1963. Today it serves 139 members. Oxford Archers info, contact: Billy Hoosock, Archery Coordinator at (607) 244-1818, or email: hhoosock@stny.rr.com . Meetings: Meetings are held the second Tuesday of every month (except August and December), at 7:00 PM. The meeting in November is to elect officers. All meetings are posted on the OxfordNY Calendar of Events. 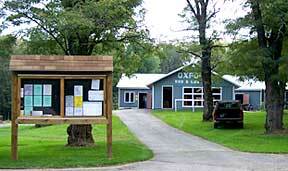 Meetings are held at the Oxford Rod and Gun Club on Ingraham Road, Oxford, NY. Directions: Take Route 220 out of Oxford (towards McDonough). Turn left onto Ingraham Road, and go for about 1 mile (you'll see the Club's sign). The Oxford R&G is 5 minutes from Bowman Lake State Park. Events: Trap Shoots (9:00 AM to 1:00 PM), Slug Shoots, Archery Course, Building Fund Raffle, Clambake, and Family Picnic. (Check the OxfordNY Calendar of Events for details). Billy Hoosock, Archery Coordinator, designed and organized the new archery course, which now features 30 Rinehart targets and a practice range with 3 Morrell yellow jacket targets, a 14 target NFAA Field course and a 80 yard practice range. The 3-D course is on the grounds of the Oxford Rod & Gun Club, set into the woods, creating very naturalistic hunting settings for the ‘animals´. They offer seven different classes: Open, Release, Fingers, Women's, Traditional, Youth (12-16), and Cubs (under 12). International Bowhunting Organization (I.B.O.) scoring areas are 10, 8, 5, 0. X's used for tiebreakers. IBO scorecards will be provided. Novelty Shoots: Eagle Eye, etc. Door prizes, 50/50's. As for archery winnings, the Club has been offering coupons instead of trophies, since it's more desirable. First place gets a free game coupon; 2nd place gets 50% off a game; 3rd place gets a $1.00-off game coupon. In the Cubs’ class however, they get to choose a very nice pewter pin, which can be proudly displayed on their quiver. In the Eagle Eye’ competition, archers pay $2.00 for 3 shots, and the winner takes all! Visit their website www.freewebs.com/oxfordarchers/ for the Oxford Archers event calendar, news, pictures and more. Take advantage of every opportunity to fine tune your shots and get in shape for the season. They have a movable broadhead target on the practice range (free), a round of 3D for $5 (30 targets, 1 arrow each), and 14 field targets for $2. You can't find a better place to practice than the Oxford R&G. If you are not a member and are interested in joining to use the ranges, the fee is $10 yearly. Before signing up for events, come early to enjoy the all-you-can-eat breakfast. The breakfasts are held at the Club every Sunday morning from 7:00 AM for bow shoots and 7:30 AM for trap shoots. Ending time is 10:30 AM for both. For $4.00, you can get eggs to French toast, cooked on the spot. The combined annual Family Picnic of the Oxford Rod & Gun Club and the Oxford American Legion, Post 376, (started in 2004) is held the 3rd Saturday in May, 12-Noon to 6:00 PM. Proceeds benefit "The John Sherman Scholarship Fund". In 2006, they raised funds to support the Oxford Memorial Library Building Fund. Together they donated $400 toward the million dollar expansion and upgrade for the 200 year old library facility. Tickets: $35/person. An annual Building Fund Raffle is held on the third Saturday in June. For a $100.00 ticket, you are entitled to a great all-you-can-eat feast with music. The building fund event will help raise money for a new furnace, a new shooting range, a new vent system for the kitchen, and yearly operating expenses for the Club. The annual "OxTAR" (OXFORD TRADITIONAL ARCHERY RENDEZVOUS), July 11th & 12th 2009; Traditional Bows Only! The annual Sportsmen's Weekend (started in 2006) is held on the third weekend in September. Hours: Saturday - 8 AM to 5 PM and Sunday, 8 AM to 2 PM. They have a variety of vendors, seminars, demonstrations, antler scoring, 3D archery shoots, novelty shoots, raffles/doorprizes, food and drink. The annual American Legion Clambake (started in 2005) is held the 1st Saturday in October from 1:00-6:00 pm, for the Oxford Rod & Gun Club Building Fund. There's live music; food; fun; and beverages. Tickets are available at: American Legions-Norwich/Oxford; Oxford Tavern, McDonough Outpost; Afton Meat Mkt. $40/person; 21 and over only. The Rod and Gun Club facilities are also for rent. Weddings, Anniversaries, Dances, etc. All are welcome to stop in and check out your local sporting club. For info contact Jim Lobdell, OGC president at (607) 843-2701 or email: JBL4949@frontiernet.net .